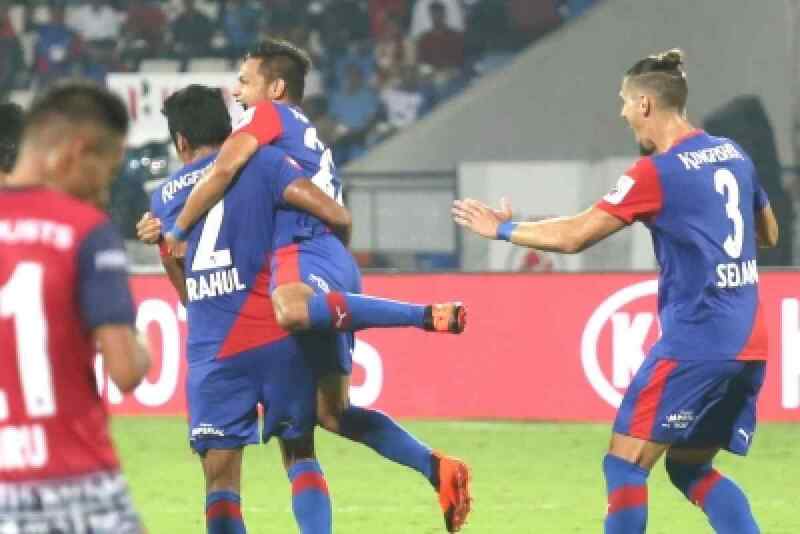 Bengaluru, Oct 7 (IANS) Late goals in the Hero Indian Super League match 9 at the Kanteerava Stadium on Sunday saw Jamshedpur FC hold Bengaluru FC to a 2-2 draw. Nishu Kumar’s stunning volley at the stroke of half-time put the hosts ahead. However, youngster Gourav Mukhi made history when he came on for Jamshedpur FC as substitute and scored on his debut to equalize in the 81st minute. Later, Sunil Chhetri’s header in the 88th minute put the hosts ahead. However, Jamshedpur’s Sergio Cidoncha’s effort in added time (90+4) denied the hosts a win at home. On Sunday, Tim Cahill and Michael Soosairaj got their much-awaited debut in the ISL as Jamshedpur FC head coach Cesar Ferrando named an attacking side to take on last season’s finalists. Carles Cuadrat’s Blues were unchanged from their 1-0 win over defending champions Chennaiyin FC. Ferrando’s side started the game on the front foot but the first real threat came from the home side 12 minutes into the match. The visitors piled up the pressure as the first half progressed but their final delivery into the box lacked clarity. Just near the half-time, the ball fell to Nishu Kumar outside the box who unleashed a stunning strike into the top left corner of the net, leaving the visiting goalkeeper Subhasish Chowdhury helpless and stunned. The hosts went into half-time with a 1-0 lead. Later, when 19 minutes was left on the clock, 16-year-old forward Mukhi replaced Jerry Maiwa to become the youngest ever player to make his debut in ISL. Ten minutes later, the youngster produced a moment of brilliance to bring Jamshedpur back into the game. Just when the visitors thought they were done for the day, Harmanjot Khabra’s long ball into the box from the right flank was headed into the net by Chhetri to put the hosts back into the lead in the 88th minute. However, Jamshedpur FC pulled one back right at the death. Arques’s cross into the box in the added time saw Cidoncha place his effort into the far post to ensure that they pick a crucial point away from home. The hard fought draw earned kept Jamshedpur FC unbeaten run here at the Kanteerava Stadium.